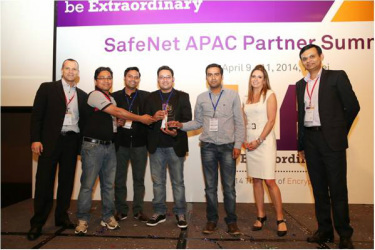 INDIA, 16th April 2014 - The global leader in data protection solutions, SafeNet, has presented Transition Systems India with the prestigious APAC Highest Revenue of the Year Award at the APAC Partner Summit 2014. SafeNet organized its first APAC Partner Summit in Yilan, Taiwan. More than 100 partners from 13 APAC countries gathered at the Summit to discuss the latest development in securing data and application in a cloud and mobile-centric world. During the Summit, SafeNet presented 5 awards to recognize the contribution and support of its top partners in 2013. Transition Systems India was recognized for the highest revenue contribution in APAC.